ragozo at his contested apartment with supporter, and EUSD preschool office manager and former union official, Carmen Miranda-Griffin. 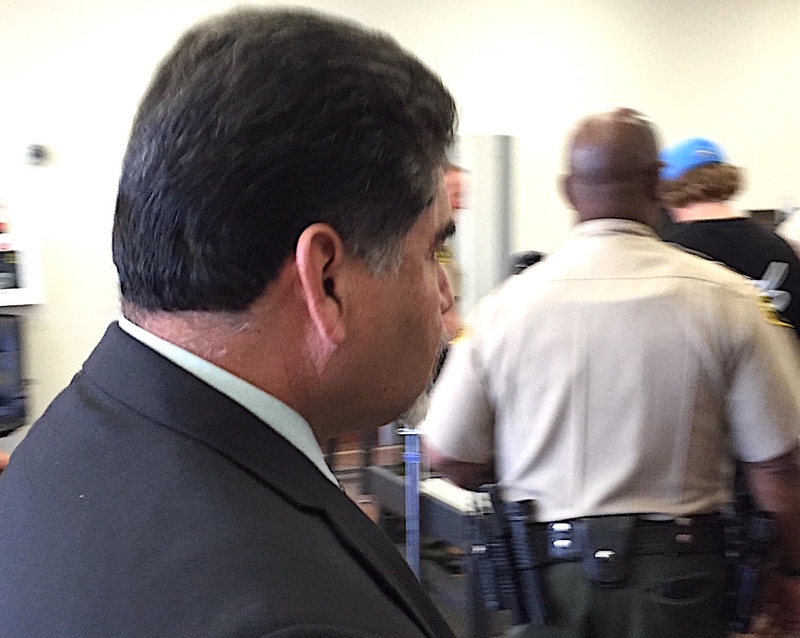 Another day, another day in court has been set for Escondido Union School District Trustee Jose Fragozo. Judge Carlos Armour called for a pre-trial hearing on Wednesday, June 22 following Fragozo pleading not guilty to 13 felony charges related to allegedly misrepresenting his place of residence to run for school board. Fragozo’s attorney Victor Torres entered the plea. A preliminary hearing last month found enough evidence to schedule the criminal proceedings. should he be convicted, Fragozo faces a maximum penalty of nine years, four months in prison if convicted. Torres, said the testimony presented in the preliminary hearing may have been enough to move the case forward, but it falls far short of proving that Fragozo didn’t live in the apartment while serving on the school board. Jose Fragozo through the Vista superior Court looking glass. Fragozo ran, and lost, district-wide elections in 2006, 2008 and 2010 in which top finishers made it to the board. Board trustees subsequently changed election procedures mandating trustees must live in specific districts they were elected to represent. 2 Comments on "As Jose Fragozo’s legal world turns"
I stand with Trustee Jose Fragozo! District Attorney Dumanis must go as she continues to villainize people of color and EUSD Board of Education Joan Gardner should be recalled immediately! Absolutely ridiculous. Mr. Jose Fragozo is a quality man with outstanding character and EUSD Board President Joan Gardner needs to be recalled. Any judge who would punish Mr. Fragozo for serving the people needs a serious review.